The 10′ x 8′ Windsor All-Purpose Shiplap Pent Shed has a very appealing look which will make it something that looks fantastic in any garden. 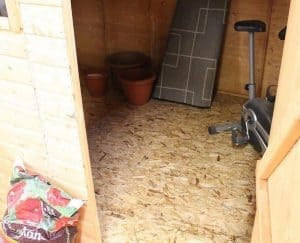 It has plenty of storage room for you to make use of and things like bikes, gardening tools, a mower and anything else you need to keep tidied away, will be safe inside here from the rain. 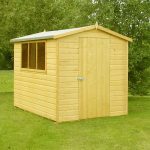 The good sized door and a large window on the front make this a very friendly looking type of shed and you can actually have a little bit of fun by deciding where exactly on the front of the shed the door and window will be placed. Some very impressive and high quality materials have been used in the construction of this shed. 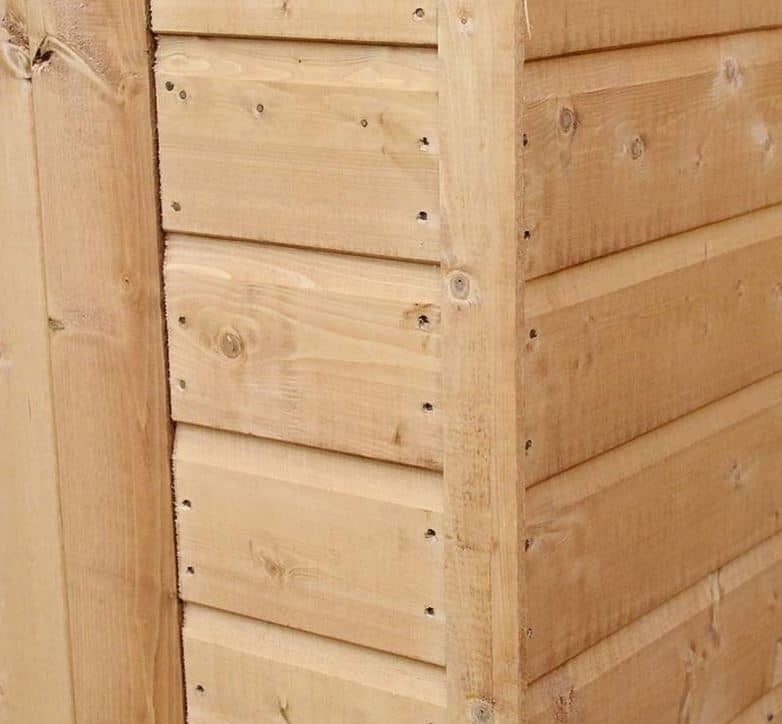 The cladding is 12 mm tongue and groove shiplap cladding which as well as looking amazing, provides items inside with protection from bad weather. The pent roof is strong enough to take heavy snowfall and also not allow the rain anyway inside. For the flooring, the floor boards have been backed up with pressure treated floor joists to allow you to store heavy items inside of here without any problems. 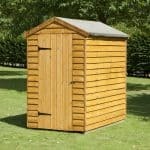 The shed looks great, provides plenty of storage space and the price is very, very reasonable. From the first moment we saw the 10′ x 8′ Windsor All-Purpose Shiplap Pent Shed, we can honestly tell you that we were very impressed. 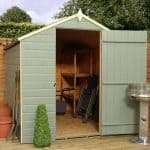 Windsor really have come up with one truly fantastic design for this shed and of course as you will have noticed already the price is just awesome for the storage space you are getting. Speaking of storage space, you are getting, 7 feet 8 inches of depth and then 10 feet of width. So yes this is a rather long shed, but wow does it look great and of course gives you plenty of space inside to make use of. The height of the shed was something that did impress us as being 6 feet 6 inches high at its highest point means, you will be comfortable inside here. Actually the lowest point is 5 feet 7 inches which is at the back of the shed and even that is not too bad in our opinion. As you can see from the pictures, the pent roof slopes to the back and it really does have a nice look to it. This roof is going to protect what you have in here by forcing the rain to always run of the back of it. The solid sheet boarding which makes up the roof is 8 mm thick and is protected with roofing felt. This we know may sound a little weak at only 8 mm, but this is actually strong enough to handle the weight of many, many inches of snow and it also does mean Windsor are able to keep the price low. This is a shed which we feel many people are going to fall in love with right away and maybe even a few of you have hit that buy button based purely on the look of it which in all honesty we would not blame you for one little bit. We love the way that the walls just have such a smooth and high quality look to them. The 12 mm tongue and groove shiplap cladding really does look great and we have no worries at all about its ability to keep our horrible British winters at bay. Keeping the shed together and making it the robust and impressive structure it is, is a round edged, 28 mm x 28 mm frame and this is to be honest far more than we would expect from a shed at this price range. Any shed that is going to last for a lot of years needs to have a strong frame as its bones and we are very impressed with what Windsor have done with the frame inside this shed. The flooring is made with solid sheet boarding like the roof is and just like the roof it is far stronger than you would think it assume it to be. The boards are not as attractive as tongue and groove flooring is, but they are still strong and they do have back up in the form of some very high quality, pressure treated floor joists. Heavy tools, a few bikes or even some kind of heavy duty mower is not going to be any problems for this flooring. As is the case with most sheds this is going to require treatment shortly after construction. A basecoat treatment will be applied to the shed, but that is only for short term protection. We always suggest treating the shed right away and then once a year. This way you will have no issues with the wood. Windsor offer one of the best guarantees of any shed manufacturer. They give you an incredible ten year anti rot guarantee when you purchase the shed. There is a single braced door on the shed that is kept in its place with high quality hinges. This will stop the door from sagging and also make it easy to open and close. Another thing that is easy about this door is getting things in and out of it. This is because the door is 2 feet 4 inches wide and 4 feet 4 inches high. One of the most prominent features of this shed is the large window. There may be only the one window, but as it is so large, you will find that lots of natural light is able to get into the shed. The window is made from anti shatter styrene which if you have kids playing in the garden is ideal as there is never any danger of broken glass. A pad bolt comes with the shed and this will make sure that door is closed tightly. Unfortunately there is no lock included, but a padlock is cheap and easy to add to the shed. 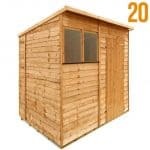 This really will make the shed a very secure structure where you will be more than happy to keep your expensive items. The window on the 10′ x 8′ Windsor All-Purpose Shiplap Pent Shed is large, but we actually really do love that about it. At the same time though it does not allow for much privacy. If privacy is something you are concerned about then a set of blinds is a way to stop people being able to look into the shed. 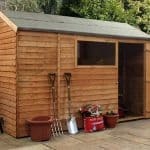 The pictures clearly show what an attractive looking shed this is and you can actually have a little bit of input into the way the shed will look. The way this shed is put together means that you can actually decide where on the front of the shed the window and the door is placed. This is something we think is really cool and it will allow you to place the door in a position which is most convenient to you. There is an installation service available, but at £319.99, we feel it is very expensive. A padlock would need to be purchased if you will be storing expensive things in here, but that is all there really is to consider when it comes to extras. This is a high quality shed that is made with some very impressive materials. What makes it even better is just how low priced it is. While you will have to roll your sleeves up once a year and give it a fresh coating. The reward for this is a shed that you can use for easily 20 or more years. 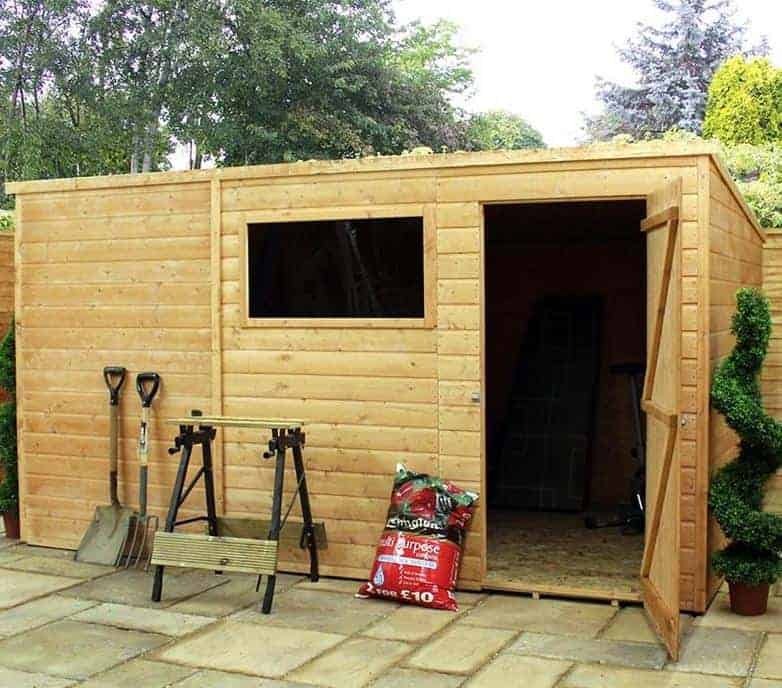 The floor space and the height of this shed is more than enough for you to keep things safe and secure or even for use as some kind of workshop. We feel that the installation service is way overpriced, but actually this is not all that hard of a DIY job and with the help of a friend, you should have this built in around 4 hours and find the experience not too bad. Especially if there is a good supply of tea and biscuits as you build. This is a shed where the price could easily have been £100 higher and we would still feel that it offers excellent value for money. Final Thoughts: The 10' x 8' Windsor All-Purpose Shiplap Pent Shed has pretty much everything you want in a shed. The space available to you is just ideal for storage or even as a workshop. You are going to be amazed at how large this shed feels when you stand inside it for the first time. 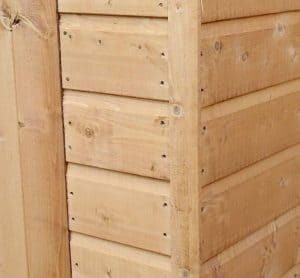 It is not just the storage space we like, we also really like the overall look of the shed and the design really is attractive so that you will be happy to have this in your garden. 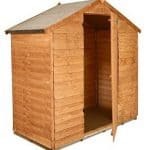 Top quality materials and a little TLC from you are going to ensure the shed lasts many years. And of course we have that very reasonable, £599.99 price tag which makes this perfect if you are on a budget, but still want a lot of space to make use of.